"ROOKIES AT EBBETS FIELD. New York: Gathered for the last day of Dodger workouts, April 16th, before the official opening game of the season against the Philadelphia Phillies on April 17th are four rookies a good look at Ebbets Field. 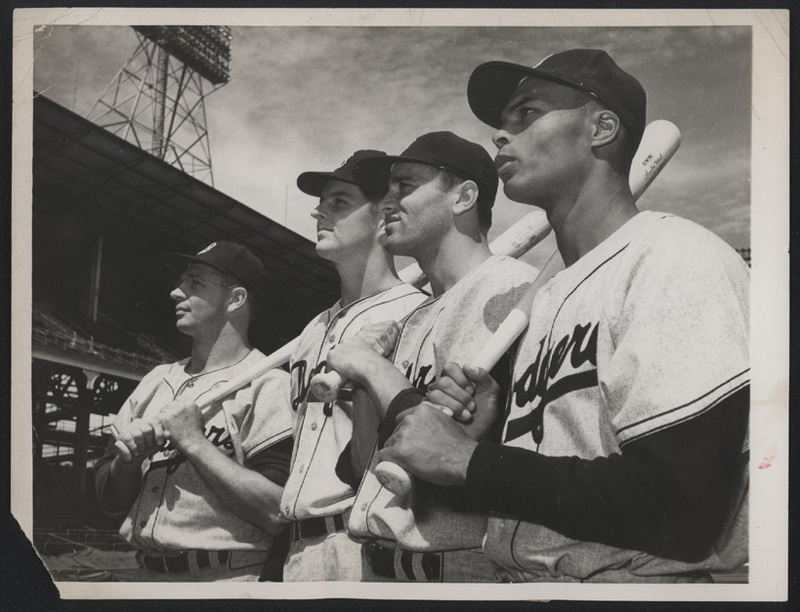 They are, left to right: Charlie Thompson; Don Drysdale; Gino Cimoli; and Charlie Neal. Neal has earned himself a starting position as second baseman in the opener." This Day in Dodgers History: In 1988 John Shelby's hitting streak is stopped at 24 games. He batted .360 (32-for-89) with two home runs and 12 RBI during the streak that lasted from May 14-June 9. His endeavors propelled the Dodgers into first place - where they stayed the remainder of the season. In 2012 Dodgers outfielder Bobby Abreu surpassed Mickey Mantle on the all time hit list at 2,416. It is with great sadness that I report that the great Gordie Howe has passed away. Mr. Hockey was 88. Here's a great video on Howe's career (link here). Via Ken Gurnick at MLB.com; "Urias' next start a high-profile outing vs. Giants." "Those are some of the best teams in all of baseball," acknowledged Roberts. "But we believe, if he pitches well and executes, which he's been doing increasingly with each start, it will be a great atmosphere, and we expect he'll rise to the occasion. They're heavy [left-handed hitters] and that's a pretty easy one to see, that's why we play the game, and it goes to us feeling confident in that matchup for our club. We've got nothing but respect for that club, but for us that gives us the best chance to win that game." Via Michael Clair at Cut4; "Mike Piazza is now the proud owner of a third-tier Italian soccer team." 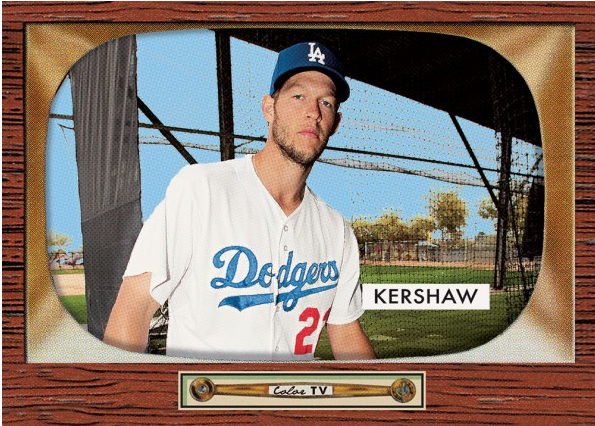 Topps is making available, for one week only, a 1955 Bowman throwback Baseball card set of six cards that includes both Clayton Kershaw and Corey Seager. You can see a preview pic of the Kershaw card below. Unfortunately, a photo of Seager's card is not provided. The other four players are Bryce Harper, Mike Trout, Kris Bryant and Stevor Story. The print run will be determined by the number of orders placed. Go here to check it out and order. Blowout Buzz shares some preview pics of the always popular "First Pitch" cards from Topps Series 2 set that is coming out next week. ON the right is the Lea Thompson "First Pitch" card at Dodger Stadium. Via Dennis Schlossman at Think Blue Planning Commission; "Dodgers Prospects: Brock Stewart Rapidly Progressing." This is just fantastic! Scott Miller at the Bleacher Report recalls how the Dodgers were able to draft Clayton Kershaw ten years ago. The Dodgers' strategy was to stay quiet and lurk in the shadows. "Some guys contacted him early and stayed on him," (Dodgers Scout Calvin) Jones says. "I didn't contact him until closer to the draft. I didn't call him and stay on him because I didn't want to alert other teams that we were on him high." That is why, in the final days and hours leading up to the draft, the Dodgers' interest took Kershaw by surprise. "Wow, I didn't talk to you much," Kershaw told Jones. "I hadn't heard from you guys." "Yeah," Jones told him. "I didn't want to alert the other teams I was high on you."